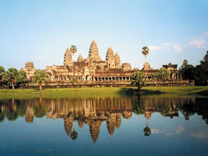 Arrival into SIEM REAP International Airport – meet/greet & transfer to Hotel – check in & refresh yourselves. Later, meet up at hotel lobby again & proceed to the monuments of ROLOUS GROUP. 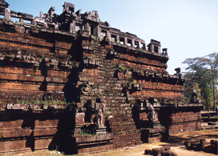 These monuments served as the capital of Indravarman 1 are among the earliest large permanent temples built by the Khmers, marking the beginning of Khmer classical art. Visit PREAH KO – a temple dedicated by the King to his ancestors; BAKONG – the largest of ROLOUS group temples with a still active Buddhist monastery & LOLEI, a temple built on an islet in the center of a large reservoir which today has become rice fields. Lunch at a local restaurant before continuing tour by Tuk-Tuk to see brick sculptures of PRASAT KRAVAN, the SRAH SRANG reservoir known as the royal baths once used for ritual bathing, BANTEAY KDEI & EASTERN MEBON temple guarded by stone figures of harnessed elephants. On the way back, we stop at PRASAT BEY, south gate of ANGKOR THOM to view the great wall of ANGKOR THOM compound along the TONLE OUM River. Stopover at PRASAT CHRUNG CORNER & visit the secret place called “TADEV HOLE”. Later we walk up the temple for the best sunset view. Return to hotel to refresh yourselves again before going out to dinner at a local restaurant. Overnight in SIEM REAP. Any extension stay must be communicated & fully paid at least 07 working days in advance. Please enquire within by calling 03-4043 2658/59.